The fact that the characters have little story is probably designed to make it feel more like you are filling in the characters shoes rather than playing through someone else’s story especially since cut scenes are few and far between. Even though Dead Island seems poorly put together on the story end of things that’s not the aspect that should draw a player into this game. Killing zombies and exploring the world are more than satisfying and the games twenty plus hour run time guarantees that you will be spending a lot of time traveling around and seeing everything this world has to offer. The island features many different types of areas including a tropical resort, a small city, and a dense jungle and all provide plenty of zombies for you to kill with whatever weapon you happen to have handy. Dead Island boils down to a first person adventure game with some RPG elements. The game takes place in a giant open world where you can travel to any location at any time. You could spend hours in the campaign and never touch a mission. While there are plenty of story missions there are also hundreds of side missions that have you traveling all over the island looking for more survivors or performing a variety of tasks for the survivors you have already found. Melee combat is the main focus as most of the game’s weapons are all items you find on the ground. You mostly start out using raft paddles and broken broom sticks but will move on to small knives and machetes and eventually find some firearms. Each character has their own unique skill set that makes them more adept with different types of weaponry so every time you play the game it should feel pretty different. Every character is level based with their own tech tree and as you level up you can pump points into their individual skills that make them better zombie killing machines. Another part of Dead Island that seems similar to Dead Rising is the ability to create weapons however unlike Dead Rising these created weapons aren’t aimed at making the game a laughable experience. 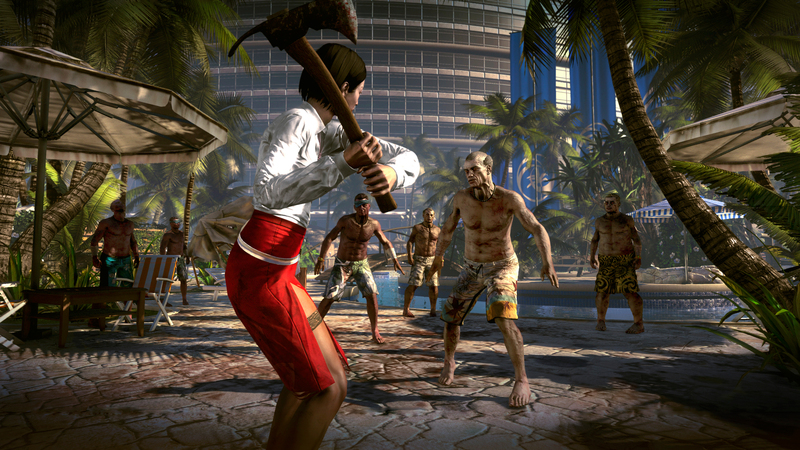 Dead Island unfolds as a very serious story and the weapons reflect a survivors attempt to have the upper hand. Dead Island actually features some interesting game play additions that I wasn’t expecting such as the ability to drive vehicles and even load supplies into the back of trucks although this is usually only story required. The game does a great job setting up the sense of survival and you often feel tense as you explore the island and for good reason as zombies can often pop out of nowhere for a good jump scare to keep you on your toes. 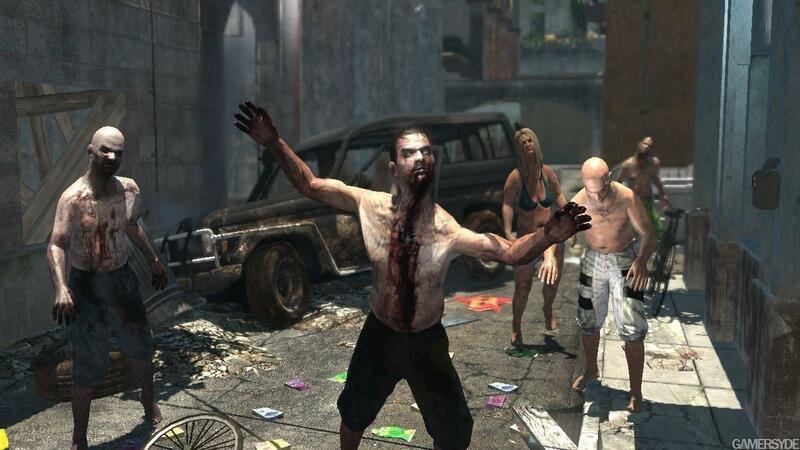 There are multiple types of zombies in Dead Island and each one comes with a different tactic to defeating it so you will often find yourself trying new things every time you run into a new type of zombie and this manages to keep the game play fresh as you aren’t just attacking the same types of enemies over and over again. The highlight of the game is definitely the combat. Even twenty hours into the game it was just as fun to kill zombies as it was in the first five minutes. There are even two control types for the melee combat (one being optional) that can have a major impact on how you play the game and after getting used to it may even make it more enjoyable. A notable aspect of the game to point out is the physical damage you perform on the zombies. As you attack them their skin rips off and you can even break bones for an experience boost. This quality really adds to the combat and makes the impact of your weapons really feel meaningful. The graphics of Dead Island are more appreciated from a distance. The game manages to look very nice for how large in scope it is but has some major graphical flaws in specific areas. During actual play the game looks great and plays smooth. It was rare that I ever felt and frame rate issues even when the screen was swarming with zombies. You get a lot of close looks at the characters and environment since the game takes place in first person and for the most part nothing looks too much like an eye sore. The most noticeable detail is that the character animations on humans seems very stiff and robot like making them look completely uninteresting but luckily you don’t pay much attention to human characters aside from performing quests. The cut scenes however are some of the worst I have ever seen in a game. With graphics and textures constantly popping in and out of focus or just disappearing completely the cut scenes of the game almost seem like an afterthought after the rest of the game was made and were thrown together in a matter of days and just thrown into the story. The animations seems even worse than the poor animations in the normal game and were so hard to watch that I actually found myself just skipping cut scenes just to save my eyes the torture. Dead Island comes with most of the problems any other open world game does but that doesn’t stop it from being an entertaining game. You could pick up this game and sit down for the amount of time it takes to beat the story and never even play one mission and still have a blast. The island is huge and filled with tons of collectibles and buildings to explore, not to mention there are zombies around every corner. There were plenty of times I found myself just turning on the game to go around killing zombies and collecting weapons and never even playing the story. On the other side of that, if you are a player who only wants to pick up the game and play the story only then you are still in for quite a treat as the missions in the game take you all over the island and right into the path of many zombies. The combat is highly addicting and you can constantly refine your skill making melee fighting more enjoyable as the game progresses. Driving the vehicles can feel a little stiff but is still satisfying when you are plowing through a horde of zombies on the way to your next objective. Dead Island is one of the most ambitious games I have seen in a long time and while I didn’t have any high expectations for this game it managed to blow me away and provide hours of fun from start to finish. Lately it could be said that there is an oversaturation of zombies in games and that it is getting a little tiring but Dead Island proves that killing zombies can still be fun and unique and is a must play for any fan of the zombie horror genre. Those who don’t like the whole zombie thing, then this game probably won’t change your mind a whole lot. It is really a great thing to see another great action horror title hit the 360, and I think the fans of the genre are going to be all over Dead Rising, as I personally would highly recommend it. Condemned 2: Bloodshot is another solid outing for Monolith and SEGA. For fans of the first game this is a for sure upgrade and a must have game. For those who may have missed it (which I have a feeling is quite a few of you), then I would highly recommend checking it out, it truly is one of the best horror action games I have played in some time.